This year we decorated a lot more then we had in previous years. Not sure why we did more but we did. 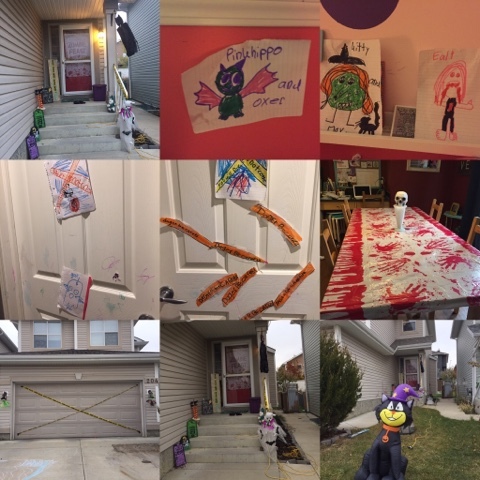 The girls even made their bedroom doors and rooms spooky too. I love how creative they are except on their bedroom doors which you can see in the photo below!! A glimpse of our halloween decor. Normally we just have a few outdoor things and halloween cat. 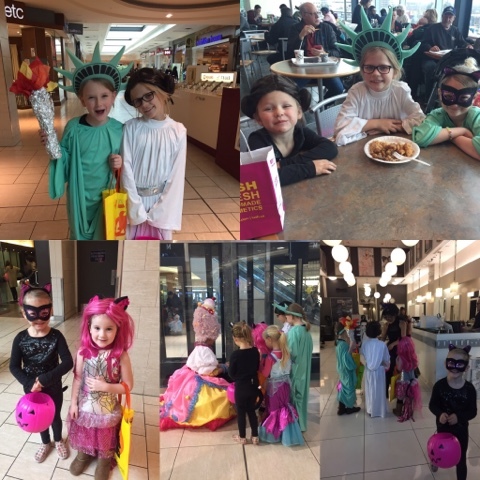 The CCSD had a PD day on Monday which meant we had Halloween off so we met up with our friends and went trick or treating at Chinook Mall. This was a new experience for me as I had never gone trick or treating in a mall in my entire life but it wasn't too bad. Chinook's Halloween activities ran from 11am to 3 or 4 and you would be shocked at the number of places that were out of halloween candy by 1130am. Some went to restock at Shoppers but many did not. It just seemed to be really disappointing. The second floor was wayyy better for candy then the main floor because everybody starts on the main floor because that is where most of the parking was. Old Navy gave out bouncy balls and the Lego store gave out Lego characters for you to build. The mall was complete chaos everywhere you went but all the girls had so much fun and the mom's got to get a little shopping in too. Thanks Michelle for inviting us out with you! 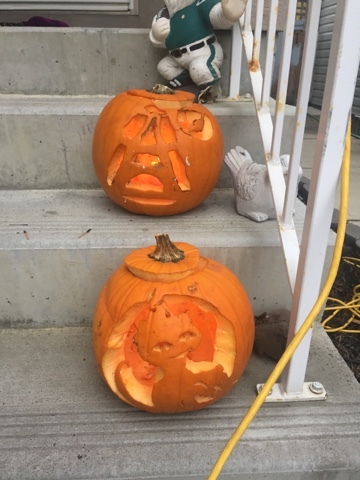 These are the pumpkins that we carved on Friday night. They finally made it outside yesterday afternoon. The top one is Finley's and it is the Eiffel Tower that Greg did by freehand. Finley was very unhappy with it because she thought it looked more like the Avengers logo then the tower itself. I think her and Greg did a great job. Penelope did the kitty with the pumpkin. Greg helped a lot and cut off the original tail by accident so he had to make a new one which infuriated Penelope. As you can see pumpkin carving was so much fun in our house that night. After the trick or treating at the mall, I made the girls come home and have some quiet time. They were up late the night before and were way up way too early that morning. They wouldn't survive a night of trick or treating if they didn't. When I was a kid growing up, we would trick or treat on our way home from school and then have hot dogs for supper before going back out with my mom and my Aunty Sandy. 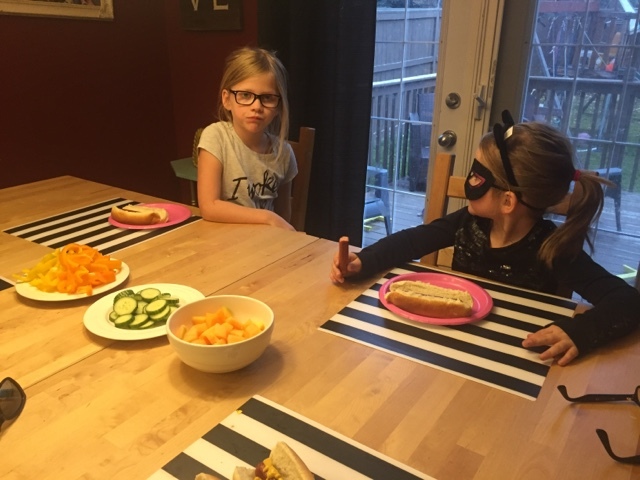 I have continued on the tradition of hot dogs for supper on halloween with my kids too. 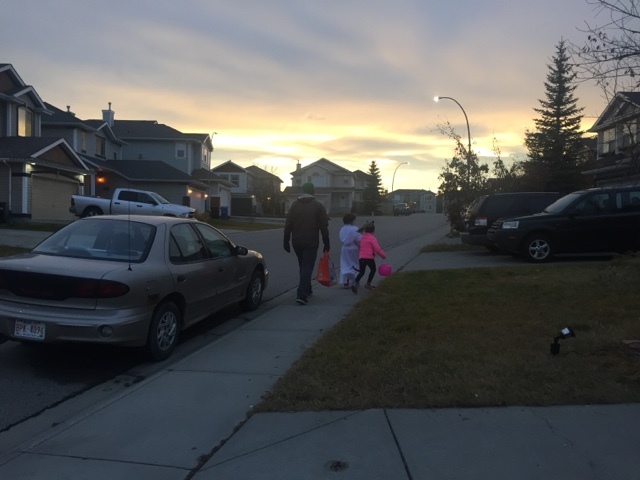 We don't trick or treat on our way home from school as that is not something that is done in Calgary and we don't wear costumes to school. The girls before they went trick or treating. As you can see Penelope is in her standard pouty pose because we made her wear a ear band under her kitty ears and a down jacket and not her very thin triple flip hoodie. She said this jacket didn't go with her costume which was lost on me since the one she wanted to wear was pink too. She also refused to wear mittens but I did put them in her pockets just in case. And soon they were off trick or treating. Penelope was happy as a clam after she went to our neighbours house. All the drama leading up to this was gone and she had candy and the world was good again. 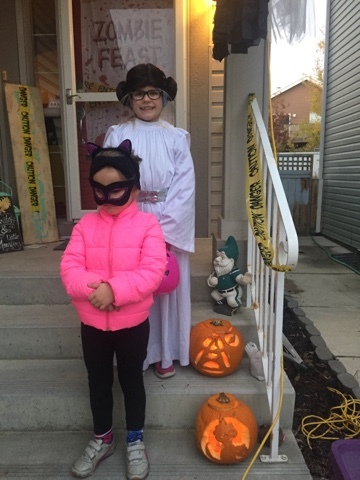 The girls went for about 90 minutes and I stayed home and handed out the candy and watched Gilmore Girls on Netflix as I waited by the front door. 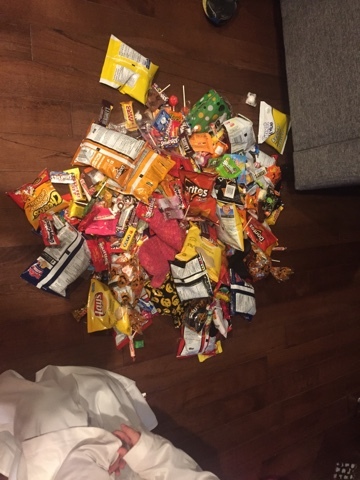 This was the girls first haul of candy. Penelope didn't go back out after coming home but Greg and Finley went for another hour. We had a lot of kids and the girls collected too much candy so by the end we were giving out chips and massive handfuls of candy to the older kids who came by later. It was a great way to get rid of extra candy. I also sent Greg to work with a large freezer bag full of halloween candy too. While Greg and Finley were gone, Penelope sorted out the candy that they collected. The girls ended up with 58 boxes of smarties which I will turn into monster cookies for them like I do every year since they get massive amounts of this candy. They also got 2 cans of pop which Greg will drink and 2 bottles of water which they drank as they trick or treated. My favourite candy are butterfingers and we got like 6 of them. I haven't ate them all yet but we handed out starburst too and I ate so many while I handed out candy that I had a stomach ache when I went to bed last night. I was worse then the kids. The good news is that I don't ever want another starburst so I think I am good haha. I might have to run a bit longer today to make up for all the candy I have eaten and will continue to eat.